Sometimes it is the simplest things that are overlooked. Case in point? The Family Emergency Plan. Here we are, so diligently putting away food, storing water and purchasing gear when perhaps one of the most important aspects of emergency and crisis planning has to do with having a plan to get in touch with family members and loved ones after disaster strikes. Equally important is having a plan for meeting up at a safe location as well an evacuation plan for getting there. Whew! Sounds like a lot of work pulling this all together. But it does not have to be difficult. Below you will find ten easy steps for creating a family emergency plan as well as on online tool to get you started. Don’t worry, this is going to be easy. 1. Sit down with your family members and decide how you will get in contact with each other in an emergency. Possible methods may be by cell phone, texting, email, or a standard land line. 2. Once you figure this out, document the contact information on both a master sheet and on wallet sized cards to be carried by all family members. 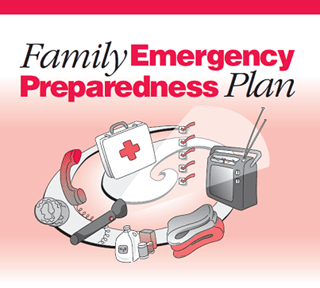 This document will become your “Family Communication Plan” and it will form the cornerstone of your family emergency plan. It will list all family members, their date of birth, and other important information. Include a photo for each person as well as any important medical information. Also include a contact number for an out of town contact person. 4. Determine the best evacuation routes from your home or workplace to the safe meeting places. Go to Google Maps or some other online tool and create maps showing your evacuation route along with printed directions. Then take the route and make sure it is accurate and that you understand the directions. This is important! You must drill and practice your evacuation procedure. 5. Prepare a list of all workplaces along with the address, telephone number, and closest evacuation location in the event getting to the pre-designated meeting place is not possible. 6. Also prepare a list of all schools that are attended by your children along with the address, contact names, and telephone numbers. Contact the schools now to learn about their own emergency evaluation policies and procedures.